HIGH QUALITY: 100% copper wire core provides you with high-speed and stable signal transmission. High quality Aluminum alloy oxidation shell is more wear-resisting and corrosion resistance, enhancing the anti-interference ability,High grade material with quality surface treatment,perfect match all 3.5 earphone,High fidelity on the music,bring you new experiences. 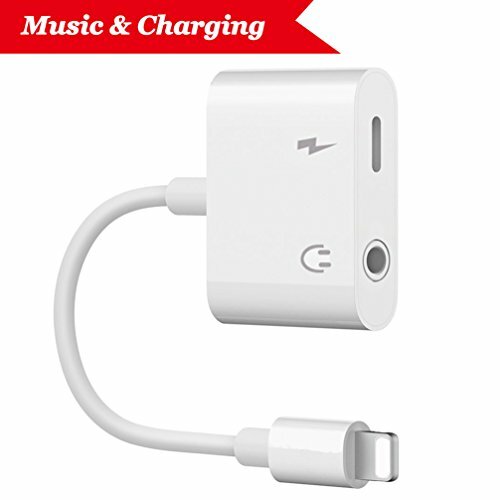 2 in 1 Aux Headphone Jack Audio + Charge Adapter- It has 2 Lightning Port, one port is for Charging, another is an audio port. Charging and Listening to music at the same time.Simply, lightweight, durable and very portable and perfect solution for all apple iPhone users.This product is one of the best choices for giving gifts to friends!! AUDIO QUALITY: The Lightning Audio + Charge supports up to 24bit 48kHz lossless output, and is compatible with the full ecosystem of Lightning Audio headphones REMOTE CONTROL & MICROPHONE: Supports remote control and microphone from Lightning Audio headphones. Also compatible with the Lightning to 3.5 mm Headphone Jack Adapter Service and warranty - We provide a 3-Month Worry-free warranty.If you have any questions , please don't hesitate to contact us. PLEASE NOTE : This adapter does not support calling function and music control.This will be a great choice for sending friends a birthday or holiday gift. 2 in 1 Aux Headphone Jack Audio + Charge Adapter- It has 2 Lightning Port, one port is for Charging, another is an audio port. Charging and Listening to music at the same time.Simply, lightweight, durable and very portable and perfect solution for all apple iPhone users.This product is one of the best choices for giving gifts to friends!! Service and warranty - We provide a 3-Month Worry-free warranty.If you have any questions , please don't hesitate to contact us. PLEASE NOTE : This adapter does not support calling function and music control.This will be a great choice for sending friends a birthday or holiday gift.